Rio de Janeiro is known for beaches, parks, museums, nature, and nightlife. 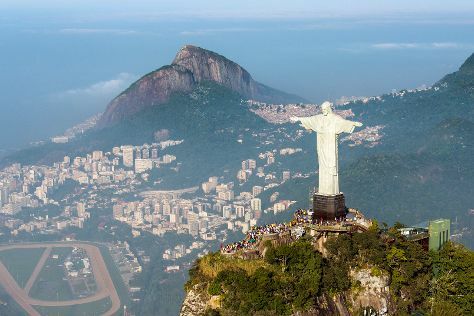 Your plan includes some of its best attractions: pause for some photo ops at Corcovado Christ the Redeemer, kick back and relax at Praia de Ipanema, stroll through Praia de Grumari, and admire the natural beauty at Jardim Botânico do Rio de Janeiro. For maps, reviews, where to stay, and tourist information, you can read our Rio de Janeiro itinerary planning website . If you are flying in from Brazil, the closest major airport is Rio Galeão – Tom Jobim International Airport. December in Rio de Janeiro sees daily highs of 36°C and lows of 27°C at night. Finish your sightseeing early on the 5th (Thu) so you can travel to Lisbon. You'll find plenty of places to visit near Lisbon: Sintra (Park and National Palace of Pena & Quinta da Regaleira). There's lots more to do: admire nature's wide array of creatures at Lisbon Oceanarium, make a trip to Praca do Comercio (Terreiro do Paco), view the masterpieces at Museu Calouste Gulbenkian, and take a stroll through Alfama. To find maps, traveler tips, photos, and other tourist information, use the Lisbon online trip itinerary builder . Fly from Rio de Janeiro to Lisbon in 13.5 hours. Alternatively, you can do a combination of bus and flight. Traveling from Rio de Janeiro to Lisbon, you'll lose 3 hours due to the time zone difference. Traveling from Rio de Janeiro in December, things will get much colder in Lisbon: highs are around 18°C and lows about 8°C. Wrap up your sightseeing on the 8th (Sun) early enough to travel to Porto. Dedicate the 10th (Tue) to wine at some of the top wineries in the area. The adventure continues: take in the views from Ponte de Dom Luis I, make a trip to Livraria Lello, steep yourself in history at Palacio da Bolsa, and stroll through Cais da Ribeira. To see ratings, where to stay, other places to visit, and more tourist information, you can read our Porto day trip planning tool . Traveling by flight from Lisbon to Porto takes 2.5 hours. Alternatively, you can take a train; or drive. Expect a daytime high around 18°C in December, and nighttime lows around 7°C. Wrap up your sightseeing on the 11th (Wed) early enough to travel back home.